PESHAWAR (92 News) – As many as six security personnel were injured in cross firing from Afghan security forces in South Waziristan on Wednesday. As per details, Afghan security forces morning fired mortal shells at a security a checkpost in the Angoor Adda area of South Waziristan. Reports of rising tensions were received as the Taliban step up attacks in Afghanistan as a part of their annual offensive. Earlier on June 22, an Inter-Services Intelligence officer was accused of involvement in a Taliban attack targeting the Afghan Parliament building on June 22. 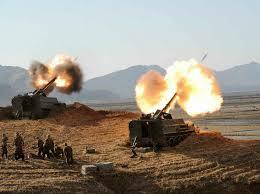 Meanwhile, mortar shells were also fired from the Iranian border into Pakistan.